The big ComicConnect.com Event auction has ended. This auction gained worldwide attention thanks to the the coup of having a CGC graded 9.0 copy of Action Comics #1 up for grabs. My post on the record breaking sale can be read here. This auction wasn’t all about the Action #1 though, there were plenty of great comics available. Lets have a look at some highlights. 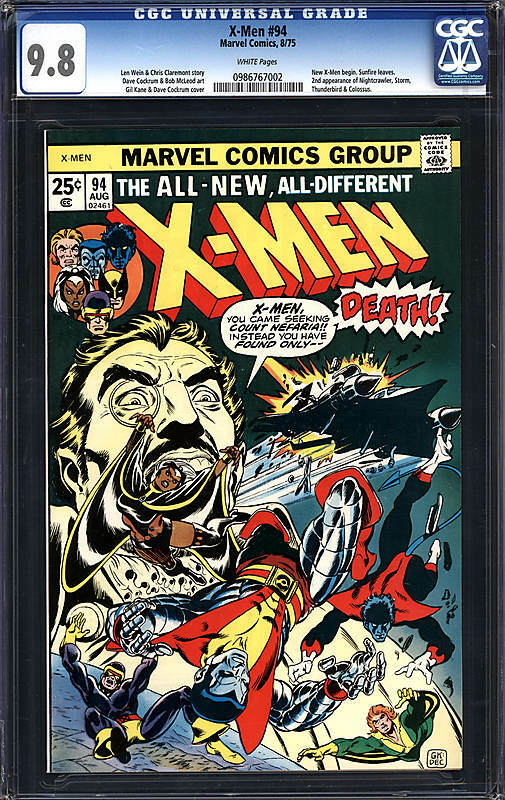 X-Men #94, Marv el Comics (August, 1975) Graded by CGC at 9.8 with White pages sold for $10,399.28 on ComicConnect on December 4th. The Overstreet price guide value for this comic at 9.2 is $1,250.00. This is more of a follow up to my Auction Highlights #59 where I showed just how much this book has plummeted over the past 2 years. It went from a high of $29,589 to a low of $8701 (in November’s ComicLink auction). I didn’t think the $8701 was a fair price for a 9.8 X-Men #94 to realize at this stage and at the end of my post I called a few more $10K+ sales for this book. Chalk one up for Walt! 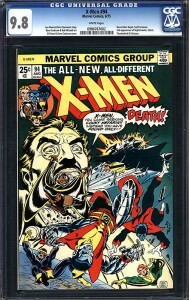 X-Men #94 is rare in this grade. For every 1000 Hulk #181’s submitted for grading 11 come back 9.8s, for every 1000 Giant Size X-Men #1s submitted 19 come back 9.8s, for every 1000 Spider-Man #129s submitted 13 come back 9.8s but for every 1000 X-Men #94s submitted only 4 come back 9.8s. By comparison the ratio for the super coveted Green Lantern #76 stands at 3 per 1000 (GL #76 is not at 1000 submissions yet so I pro rated the figure). Relative scarcity does not seem to be helping much though. Advantage Seller because the days of 10K + for this book are numbered. 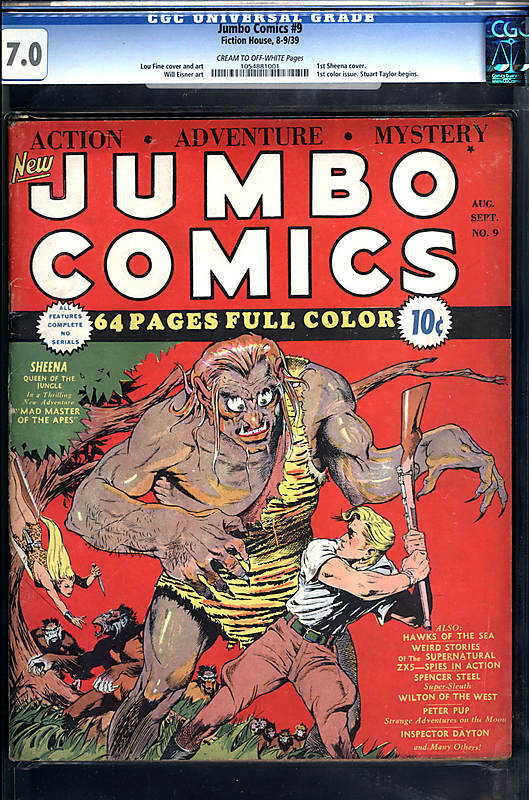 Jumbo Comics #9, Fiction House, (September, 1939) Graded by CGC at 7.0 with Cream to Off-White pages sold for $5,000.00 on ComicConnect on December 1st. The Overstreet price guide value for this comic at 7.0 is $2,275.00. This is why I love ComicConnect auctions. They pull out these super cool ultra rare Golden Age gems that I don’t see anywhere else. 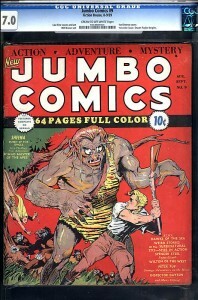 Jumbo Comics #9 is a great Golden Age comic book, it has a lot going for it. It’s from the mythical late 1930s, it marks the first colored issue for the title and it offers up a great Lou Fine cover, the 1st featuring Sheen Queen of the Jungle. Comics like these are almost impossible to find and as you can see with the more than double guide results demand is high. 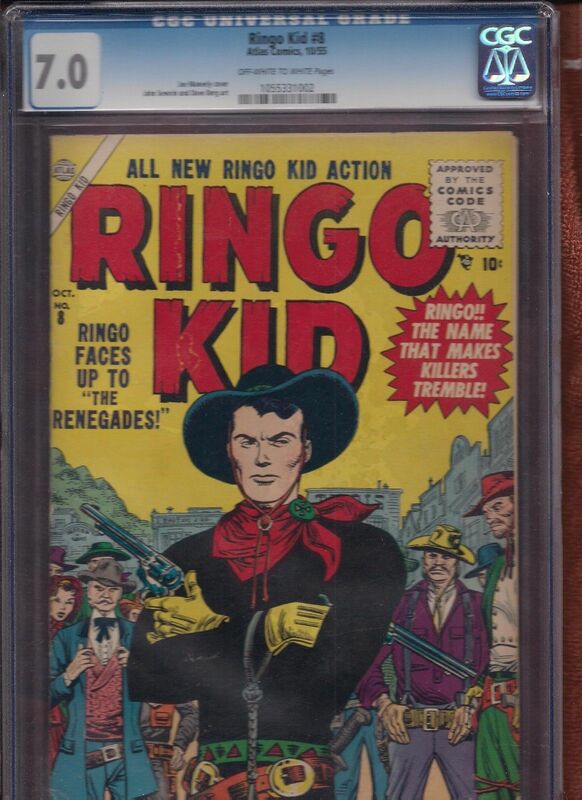 Issues like these are so rare and so seldom come to market that they are almost viewed as one of a kind and I think the market will continue be strong for books like this. Advantage Buyer due to too many positive factors for this book. 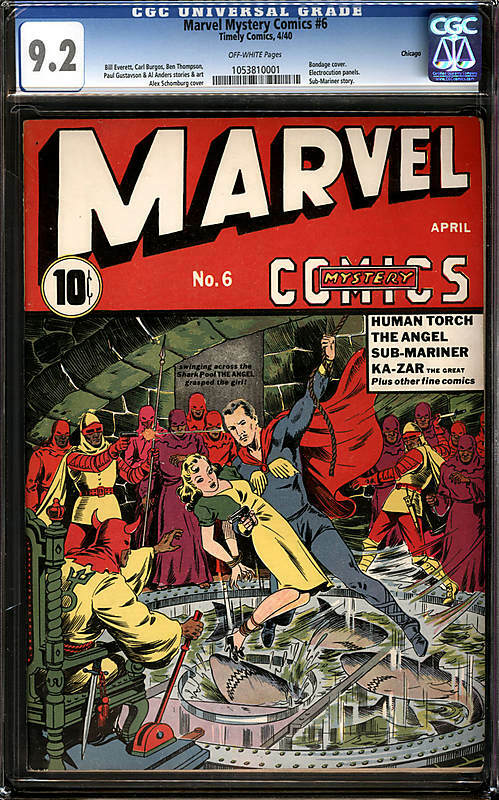 Marvel Mystery Comics #6, Timely Comics (April, 1940) Graded by CGC at 9.2 with Off White pages sold on ComicConnect for $$20,000 on December 2nd. The Overstreet price guide value for this comic at 9.2 is $18,000.00. OMG! Another heavyweight and another reason I love these ComicConnect auctions. At this point in time it seems the very early Actions and Batman Detectives are getting much more market demand than the early copies of the very tough Marvel Mystery run. Don’t count these early Marvel’s out, excpecially when they surface in exquisite shape like this gem. 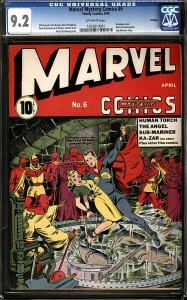 I do expect the early Marvel Mystery Comics to do a bit of catching up sometime soon. 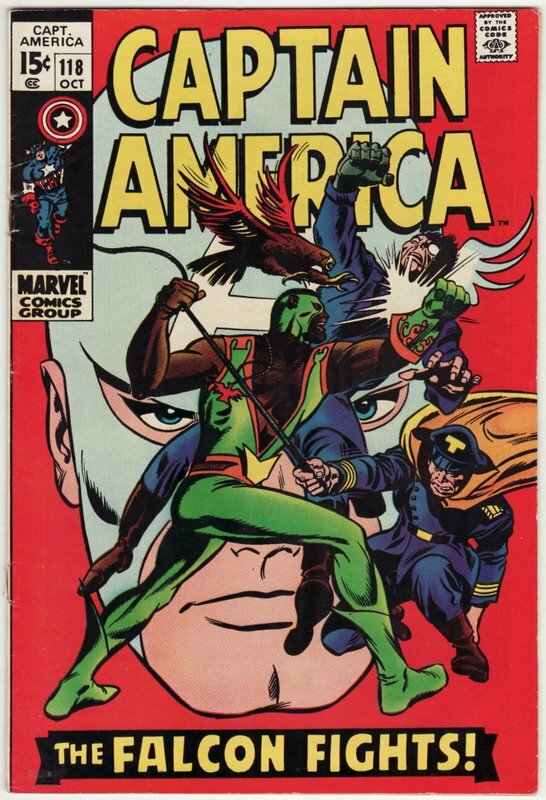 This is the highest graded copy and boasts a truly classic Schomburg cover. I think 10% above what I think is a conservative guide price is a no brainer. 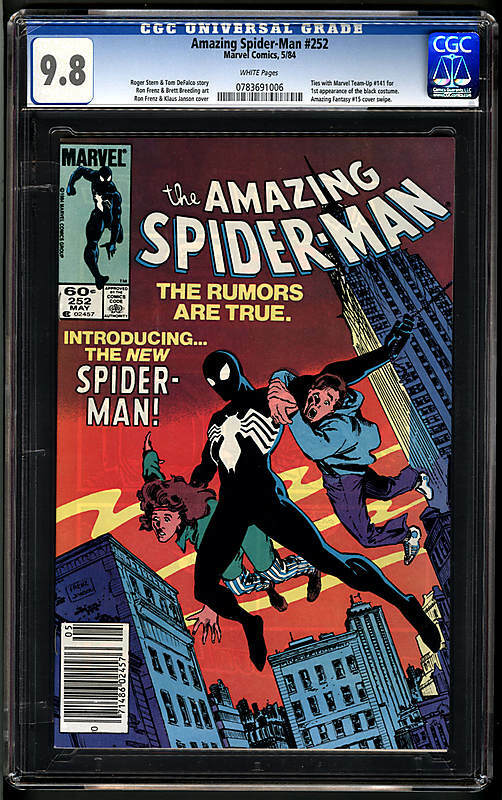 Amazing Spider-Man #252, Marvel Comics (May 1984) Graded by CGC at 9.8 with White pages sold for $168.00 on ComicConnect on November 30th. The Overstreet price guide value for this comic at 9.2 is $65.00. This result seems to fly in the face of comictrend.com’s bronze Age index results. 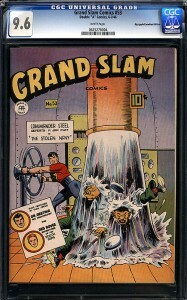 The site highlights the collapse of an important group of Bronze Age books in the CGC 9.8 grade. This book is actually in the group of books tracked by comictrend.com but it is bravely defying the price collapse by staying only 6% off its historic average. Impressive when you consider that there are around 500 on the census. What helps the book is its low guide value, it being a key comic (1st black costume) and it being embedded in the flagship Amazing Spider-Man run. Remember, that counting all comics from the Silver Age to now 1 in 4 collecting dollars invest in Amazing Spider-Man. The title is like a safe haven! Still, there are just too many nice ones out there ungraded for long term sustainability. 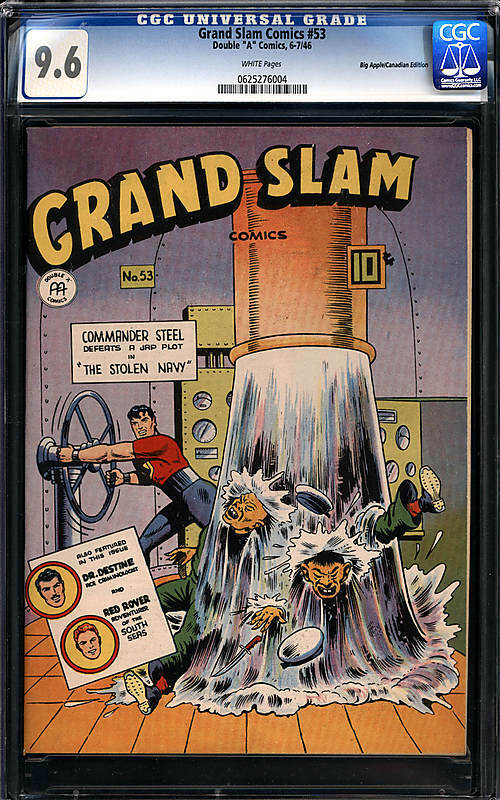 Grand Slam #53, Anglo-American (July 1946) Graded by the CGC at 9.6 with White pages sold for $186.00 on ComicConnect on December 1st. There is no Overstreet value for this comic. Yay! I won this auction! Well, I had to put my money where my mouth was with this auction. My Undervalued Spotlight #103 featured the very 1st of these Canadian Whites so when I saw this auction I knew I had to bid on the book. It was the only honorable thing to do. 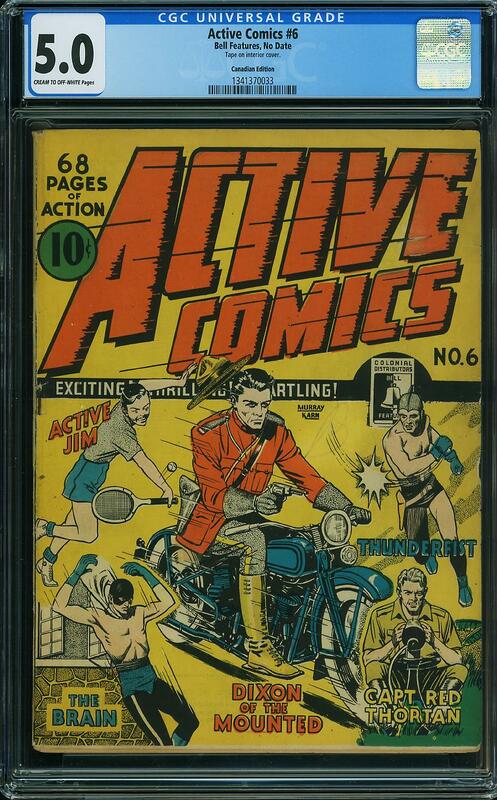 As far as I know it is the nicest Canadian White ever graded (I took a quick poke around the net and could not find a CGC 9.8 Canadian White). So there’s my first look at a ComicConnect auction. I’m already looking forward to the next one. Good to see some of those involved in this CGC madness come to tears. Loses on Uncanny #94 were a long time coming. The market adjustment is very badly needed; particularly on books printed since 1970. Granted that there are an increasing number of cgc 9.8 bronze age keys and thus a continual price correction- there will be an eventual halt to these census numbers. 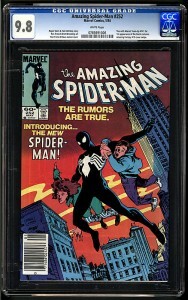 CGC gave out alot of 9.8s from pressed books and gift grades this year as they were in a mad rush to grade books and had 2 cgc graders quit their job. They were backlogged and needed to push them out from an operations point of view. But you can only sandwich them so many times and the supply of hi grade books will not suddenly increase. In my opinion I see bronze age being the best investment ever at these prices even more so than silver age by a wide margin. The only matter from a long term perspective is the sustainability of the comic collecting hobby as a whole can be questioned. The real collapse of hi end cgc books pricewise can be attributed to gpa analysis. Where all collectors are given a wealth of information and nobody wants to pay more than the next guy. As a result there is a spirally downturn in prices causes previous buyers who paid more to lookaway in disgust and take their lumps with a “I’m never gonnna buy again attitude”. Loss of these previous buyers causes prices to decline further in an auction format. Seeing these key books pop up each month in at least 1 of 3 auction sites gives the impression that these books are not rare. The cgc census is further questioned when pressed books are not removed from the census as old labels are discarded but not removed from the census. There you have it a no holds barred reflection of the current state of the hobby.